When the Kohelet Prize was announced this year, we knew we had to tell our story. If there is any group who not only failed, took a risk, failed, reached for success, took more risk…and the cycle goes on…it’s us. This is what has made us what we are! We are Mesivta 404. Mesivta (in a box) not found. To be 404 you first have to throw out all of those limited definitions of important words like success and failure. When learning and growing, there can’t be static labels for a constantly-developing process that never ends. In many ways, our community’s education structure for boys needs an overhaul. Speak to just a few high school students and you will hear stories of feeling controlled, shamed, hemmed. You will also realize how many are just not realizing their thinking or spiritual potential. Judaism values the unique mission of each of us…yet our schools struggle to allow for that discovery. 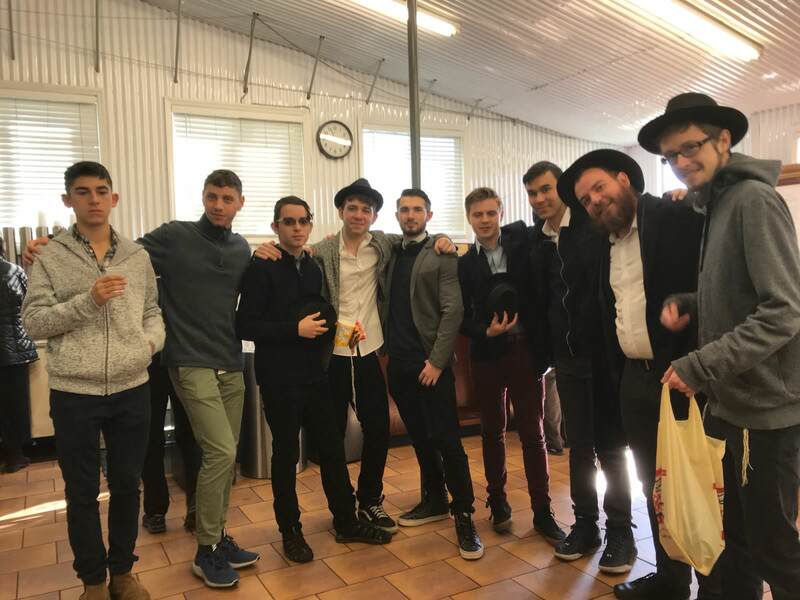 A student’s connection to Torah and his desire to adopt our community’s values are at risk. Equal to a boy’s feeling of accomplishment and belonging is his chance at finding his place among our people. But departing from the path of least resistance is hard. Taking the risk to do something different might just have to come from desperation. That is the origin story of 404. Of course you are also welcome to enjoy the ebook in it’s print form (but you will have to have a QR code app to see the video). In the fall of 2016, with just two students who had left formal mesivta behind, we set out to set a hypothesis. Could Jewish learning online work? If so, how? Could it be scaled? If so, this would open a world of opportunity to boys in our community who are not fitting into a traditional mesivta setting. It would also connect the best educators to boys who might not live in proximity. Could high-quality Regents courses for the English program be delivered through an international accredited school with instructors that would never be available in our community? At first, our ideas seemed to work. As long as it was only the two of them, the classes seemed personalized enough to succeed. But, soon after, when a third and fourth boy joined. The design began to break down. What was first thing that went wrong? Crowd control and engagement. If you are an online instructor it is very hard to see what is happening outside the frame of your camera. It is also difficult to convey warmth and emotion…to sometimes give a physical high-five. But paying our online teacher left little to no money to hire an assistant. We were going to have to make due. We began to try out new designs. Would using separate headsets and devices work better than one screen? How about using technology to filter and block student’s activity during learning times? Was there a preferred way of seating? Scheduling? Everything we tried to engage the boys during classes worked for a short while, but within a matter of weeks began to break down. Their online teacher flew to New York twice to try and simply connect with them. This, too, hardly seemed to matter. The boys had discovered how little oversite really existed in their new situation. They had gone from the extremely controlled environment of yeshivah to reckless freedom. Yet, with little time or resources, we adults didn’t seem to know how to fix it. By the time spring arrived, the boys were barely showing up for classes or learning. The few who were enrolled in math and language classes in the afternoon had fallen behind and dropped out. The space they were occupying was filled with clutter, garbage and worse. They all seemed to spend hours playing video games together. And they didn’t really seem happy. Although it must be every teenage boy’s small dream to be able to experience true freedom from structure and responsibility. They had arrived in that place to find it quite empty. We adults seemed to be at a loss to reign in what had begun to grow into a monster. We tried to hire an assistant to at least provide supervision. They talked right over him. Every way he tried to add structure made them almost laugh. We called a meeting with the boys before announcing that we would be finding a different alternative for next year. We hoped at least to document what had gone wrong and to extract some learning lessons from the experience. Before the meeting, we had decided that we would ask them if they would want to consider forming a more formal high school under the official auspices of Lamplighters, but were pretty convinced that we all would decide to pass. The room was packed. The boys, a handful of educators who had been involved with the program, 404 parents, Lamplighters board members and guests came together. We started by listing everything we had learned over the year and what we might advise others about starting a program such as 404. At some point, one of the boys suggested we keep a “wish list” for our new school. NEW SCHOOL??? Wait…we thought we were closing! We casually asked the boys whether they thought we could start a successful program out of the ashes of 404. It was unanimously “yes.” Immediately, we shifted our work to start the planning. What would be our vision? Structure? What resources would we need? How would the boy’s attitudes and behaviors need to change? Lamplighters Mesivta had been born. The hard work had just begun. During the summer of 2017, we began the planning of 404 2.0. We identified several basic principles that would need to be structured if we had a shot of succeeding. We would need the right teachers, the right space, the appropriate curriculum and instruction—but most importantly, we would need a commitment from the boys that they would partner with us to build a school that would work. Several important components needed to be worked out with a delicate balance: using technology in a productive way, implementing a proper schedule that works with the boys’ energy, allowing students to be responsible for parts of their learning while providing enough structure and, most importantly, building a positive reinforcement system to focus on the light, rather than to fight the darkness. Each of these components required a whole series of design meetings and prototyping in order to follow through on our commitment to partner with the students, rather than just imposing from above. The most exciting moment of the summer was when the mesivta boys began to learn how to CAT5 wire and set up the IT network for their new building. They helped with part of the renovation of their new space, including picking out and assembling the furniture, as well as wiring lighting and even acted as janitors of the building. Talk about ownership. In a school that values process and collaboration there will always be risk. Whether the risk is being judged for our choice to do things differently and depart from community norms, whether it be experiencing the consequences of the fact that without control students may choose to be non-productive or experiment with “breaking the rules,” or risking our reputation as educators…these will never go away. But the “what if…” is what inspires us. Therefore, equal to the risk is the reward. Even though we are now Lamplighters Yeshivah, we will always be 404 (school in a box not found). During the process of building this prize entry we learned so much together. For the first time we captured our stories and perspectives in video. We learned to film and edit. We now know how to design an ebook. Rabbi Fenton, Morah Rivkah and Reb Vadi took time to reflect on our journey and how fortunate we are to have been given the blessings we experience by being a part of this special community. Of course, students partnered with teachers to apply for the prize–in our school students are teachers and teachers are students. We hope our story of risk-failure-opportunity is not only inspirational to others…but becomes a living proof-of-concept. This is already happening, as more and more boys call us to ask to join the program. More and more educators are calling to visit. Other educators are considering what we are learning to be important. Our future is full of possibility. Here we are together (but without Morah Rivkah). You can see video of Rabbi Fenton and Morah Rivkah in our INTERACTIVE EBOOK. Enjoy! Rabbi Yehuda Fenton is the main Kodesh teacher and head of the Lamplighters Mesitva (404). Morah Rivkah Schack is the main teacher of secular studies and design-process facilitator. The two are forging a path of yeshivah education in the Crown Heights community with a new format--one that challenges students to co-design their learning and their school environment. An experienced yeshivah educator, editor of chassidic texts and well as a life-long learner (who can also teach about the science of cooking! ), Rabbi Fenton joined the mesivta this year. Morah Rivkah, a school founder, principle, teacher trainer and curriculum designer extraordinaire, is both a mom and teacher for the mesivta (and especially loves teaching creative writing to reluctant authors).